Sen. Bernie Sanders speaks at the New Hampshire AFL-CIO Labor Day breakfast in Manchester, NH. During a televised interview last Thursday, Sen. Bernie Sanders (I-Vt.) lambasted CNN's Chris Cuomo for asking about the 2020 presidential race. "People are sick and tired of it!" 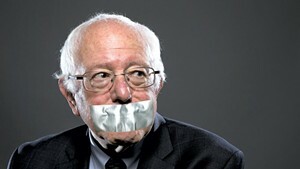 Sanders exclaimed. "We don't need to have never-ending elections!" His words are consistent. Sanders has yet to announce his plans for 2018, when he will be up for reelection to the Senate. But his actions? Well, on Labor Day, four days after the Cuomo exchange, Sanders was acting just like a presidential candidate: delivering campaign-style speeches in New Hampshire, home of the first-in-the-nation primary and birthplace of never-ending elections. And his performance showed exactly why there's so much speculation about the runner-up in last year's Democratic contest. On Monday, he captivated two audiences representing very different parts of the liberal electorate. 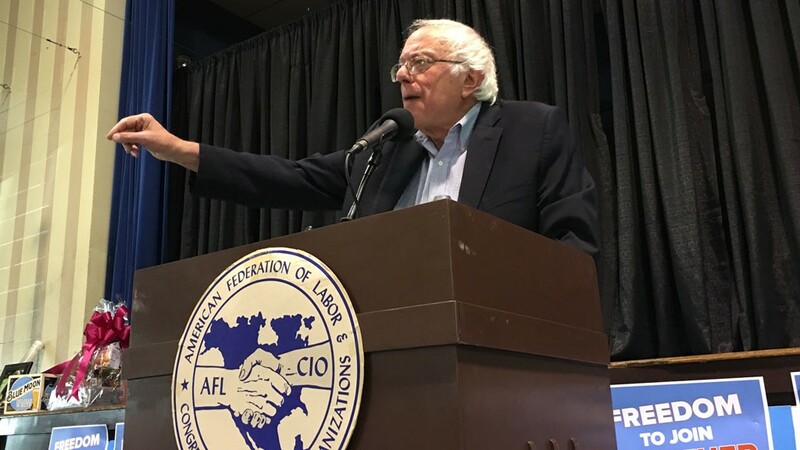 First, in Manchester, he keynoted the New Hampshire AFL-CIO Labor Day Breakfast, a gathering of the traditional base of the Democratic Party. Then, in Concord, he spoke to a crowd of enthusiastic progressives, many holding signs calling for a Sanders presidential run in 2020. The Vermont senator's political powers were on display at two political events in the most political state in the union. Which is fine, but he can't honestly go all Casablanca on us, professing to be shocked — shocked! — that politics is going on in here. To be sure, there are other reasons for Sanders to be in New Hampshire. "Clearly people who voted for him here and worked for him are extremely interested in what's going to happen," says Kurt Ehrenberg, New Hampshire political director for Sanders' 2016 campaign. "We'll see him here either as a candidate or as the leader of the progressive movement in the United States." New Hampshire's top Democrats view him as a force to be reckoned with. They speak of him with respect and choose their words carefully. Stands to reason. After all, he beat Hillary Clinton by 22 points in the Granite State's presidential primary. Like their Vermont counterparts, party pols may love Bernie, or their feelings may be, shall we say, nuanced — but he is a fact of life. "Sen. Sanders has been a supporter of the New Hampshire Democratic Party for years," says Ray Buckley, chair of the state party since 2007. "He has never said no to standing with us. That's why we stood with him when he was being challenged [during the 2016 primary] about whether or not he was a bona fide Democrat. The New Hampshire state party stood solid with him because we believe he's a Democrat and a good Democrat." Sen. Jeanne Shaheen (D-N.H.), an early Clinton supporter who addressed the Labor Day breakfast and departed before Sanders showed up, offered lukewarm praise on her way out. "I think the fight that he's made to support the middle class, to trying to address income inequality, has been very important," she said. "His voice continues to be important." I could think of stronger adjectives. The Labor Day breakfast was held in a combination gymnasium/auditorium inside St. George Greek Orthodox Cathedral, a grand edifice towering over a quiet residential neighborhood. About 300 people filled their plates at a buffet table and then strapped in for a lengthy set of political speeches. There were union officials, candidates, state lawmakers and three of the state's four members of Congress. By the time Sanders took the stage, the event was nearly two hours old. Quite a few seats had emptied. But those who remained were, as ever, enthralled by his message. He opened with the obligatory nod to organized labor. "The union movement reminds us of a very simple but important reality," he said. "When people come together in solidarity, when we understand that your struggle is my struggle and my struggle is yours, when we come together, we win!" By contrast, he said, President "is trying to divide us." Sanders excoriated Trump's decision to terminate the Deferred Action for Childhood Arrivals program as "cruel and ugly" and promised to fight in Congress to make the program permanent. And then, like the Rolling Stones on tour, he played the hits and played them well: income inequality, campaign finance, "millionaires and billionaires," free tuition at public colleges and universities, and health care as a human right. He bashed the media for obsessing over stuff he doesn't want to talk about. He promised to introduce legislation "within two weeks" to make all Americans eligible for Medicare. The breakfast concluded without fanfare. There was no linking of arms on stage, no singing of "Solidarity Forever." Most of the top elected officials had already departed. Sanders quickly made his exit, greeting a few supporters as he strode for the door. Next on the agenda was a midday rally in a quiet corner of the state's capital city. Rollins Park is a sprawling place full of magnificent trees in a well-manicured neighborhood in southern Concord. Nowhere near the corridors of power, but a really nice place to spend a perfect late-summer day. The rally, organized by the advocacy group Rights & Democracy, attracted at least a thousand people. Democratic Party regulars were vastly outnumbered by the true believers of Sanders' self-proclaimed political revolution. Sanders did not disappoint, delivering his Greatest Hits yet again with a combination of practiced skill and real sincerity that most politicians can only dream of. There was one significant deviation from his Manchester speech: He closed the Concord event with a call for fighting climate change, an issue that he apparently deemed unfit for an audience of blue-collar union members yearning for the Good Old Days of American manufacturing. It's a fair bet that almost everyone at the rally would be more than happy to see Sanders run for president again. 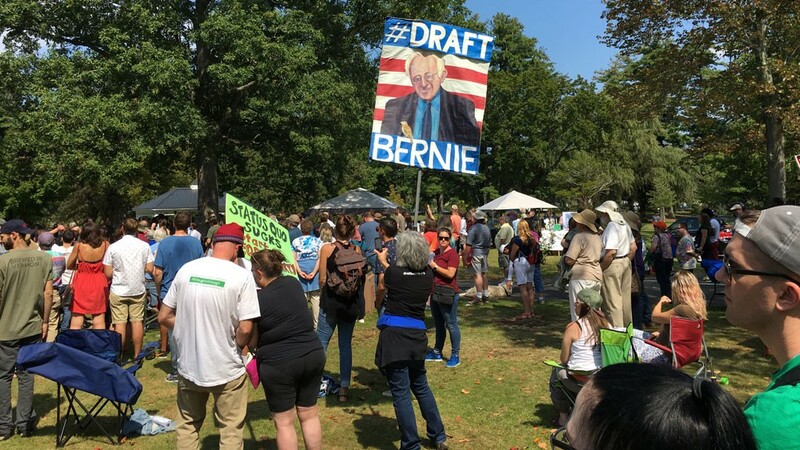 Many people held professionally printed "Draft Bernie" signs. And there was the T-shirt for sale that bore an outline of Sanders' unkempt hair and the legend "Hindsight 2020" beneath. In context, Cuomo's question seems perfectly reasonable: Will Bernie run for president again? The man himself, as usual, had no time for the media. Ehrenberg wouldn't hazard a guess on Sanders' role in 2020, but he did maybe let something else slip out. "Sen. Sanders has to get reelected to the U.S. Senate, which he's working on in Vermont right now," Ehrenberg said. "Once that election is over, he'll consider his options beyond that." Oho! Running for reelection, is he? Disclaimer: The opinion voiced above is arguably that of Ehrenberg alone and does not necessarily reflect the views of Sanders' reelection campaign organization, which does exist — and is actively fundraising for 2018. Hey, remember those video gambling machines? The ones used in a pilot program by the Vermont Lottery and then warehoused when the legislature said no to continuing the program? Back in April, Seven Days' Terri Hallenbeck reported that, for almost a full year, the 25 machines had been sitting in storage at a cost of $8,000 per month. At the time, acting Lottery Commission chair Martha O'Connor explained that "there was hope" the legislature would change its mind. But it showed no sign of doing so. Apparently the Scott administration was paying attention, because it took quick action to get rid of the machines. "As of July 1, the state is no longer paying for them," Scott spokesperson Rebecca Kelley wrote in answer to an email inquiry. "Once we determined there did not appear to be an appetite for redeploying them, we worked with the vendor to get the machines returned." Which leaves a policy question. 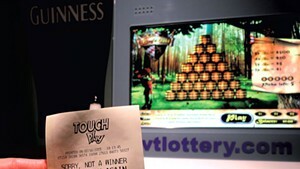 The machines were one way of squeezing more revenue out of state-sanctioned gambling — and, as O'Connor noted in April, the Lottery Commission does feel pressure on that score. Kelley wouldn't rule out a return of video gaming but acknowledged that in the legislature doesn't appear interested. As for other ways to increase revenue, a liquor and lottery task force established by the legislature will be brainstorming the issue. "The administration believes there are opportunities to increase yield," Kelley wrote, "but there needs to be a balance to ensure responsible participation and moderation." Of course, one man's balance is another's moral hazard. This wouldn't normally be the place for news about Pride Week, but there's one event with a political dimension. On the evening of Thursday, September 7, at Burlington's Main Street Landing, four Democratic lawmakers will talk about the realities of political life: "How public servants balance everything: job, family, legislature," explains Susan Hartman, executive director of the Pride Center of Vermont. "We want a down-to-earth discussion about the realities of public service." The event is designed to encourage potential candidates from the LGBT community. Pride Center is hosting the event, but the idea came from Jim Dandeneau, House campaign director for the Vermont Democratic Party. "We want the House caucus to better reflect Vermont," he says. "There are areas where we could do better." Which raises the question, how many openly LGBT lawmakers does Vermont have? The answer, with apologies to anyone omitted, appears to be at least seven. Sens. Becca Balint (D-Windham), Brian Campion (D-Bennington) and Debbie Ingram (D-Chittenden), and Reps. Brian Cina (P/D-Burlington), Diana González (P/D-Winooski), Bill Lippert (D-Hinesburg) and Matt Trieber (D-Bellows Falls). That's 3.8 percent, which is slightly lower than the state's LGBT population of 5.3 percent, according to a 2017 Gallup poll. But none of the seven represent the transgender population. And when a group is not represented, things can fall through the cracks. So says Brenda Churchill of the LGBTQIA Alliance, which represents a coalition of LGBT groups at the Statehouse. Her job is twofold: to advocate for issues of interest and to review every bill before the legislature. "We examine the language of proposed bills," she says. "People can be excluded, not on purpose. That's where we have an impact and make a difference." In the 2018 session, Churchill will be watchdogging H.333, a bill that would designate all single-occupancy public restrooms in the state as gender neutral. The measure has passed the House and awaits action by the Senate. Another issue that's likely to come up: adding a third gender designation to driver's licenses, along the lines of Oregon's offering of M, F and X. House majority leader Jill Krowinski (D-Burlington) has been researching possible legislation. That's the kind of issue that can fall through the cracks in a nondiverse legislature. "The idea of M, F or X doesn't occur to me because I'm not nonbinary," says Hartman. "It's not my existence, so it doesn't come to mind." Diversity, she points out, is not just a matter of tokenism. It's the basis for better lawmaking.